When I am in a pinch for time but want something special for dessert I often fall back on preparing a crostata. Sometimes called a galette in French cooking, this free-form tart has endless variations. A crostata is made by rolling out pastry dough into a large round. The fruit is placed in the center of the pastry and the dough is pulled up around the fruit and folded over to create a rustic looking tart, rather than a perfect-looking formal fruit tart. This couldn’t be easier. The unassuming appearance is a good thing. Even my friends who fear pastry making have great success with this recipe because it doesn’t have to be picture perfect. The rough country look also expands the opportunity for variation. I have seen versions that feature thick raspberry jam, fresh pitted cherries, apricots and nectarines, blueberries and raspberries to name a few. Depending upon the sweetness of the fruit you select you may need to adjust the amount of sugar you add. Make sure to roll out the pastry dough to a large 13-inch circle. I keep extra flour on the pastry slab and rolling pin to keep the dough from sticking. The dough can be immediately rolled out and doesn’t need to rest because I use frozen butter that keeps the dough sufficiently chilled. I also use white pastry flour that has a lower gluten content and does not need to rest. If you are using all-purpose flour you can chill it for a half hour before rolling out. In this crowd-pleasing dessert, the skin is deliberately left on the peaches for a rustic texture. Nectarines can be substituted for the peaches if you like. I like to serve this warm so I will bake it an hour or two before serving. Don’t forget a scoop of French vanilla ice cream. Prepare the pastry: Place the flour, salt and sugar in a food processor fitted with a metal blade and process for about 5 seconds. Add the butter and a few tablespoons of water and process until you have a crumb-like texture, about 5-10 seconds. Pat the dough into a round form for easy rolling. If using pastry flour continue immediately. If using all-purpose flour, refrigerate, covered for half hour. On a floured surface roll out the pastry into a round 13 inches in diameter. Roll the pastry back onto the rolling pin and transfer it to the tart bottom round, laying the dough flat to cover the round with a 3 inch border overlap all around on the baking sheet. Refrigerate while making the filling. Preheat the oven to 400F. In a medium mixing bowl, combine 1 tablespoon sugar, 1 tablespoon flour and the peaches. Remove the tart from the refrigerator and sprinkle 2 tablespoons sugar and 1 tablespoon flour evenly over the center of the crust. Arrange the fruit mixture in the center of the pastry and then fold about 3 inches of the pastry edges up around the fruit, making pleats, to look like a free-form tart. Use your thumb and forefinger to make the pleats in the pastry. Brush the pastry with water and evenly sprinkle the remaining 2 tablespoons sugar over the pastry and fruit. 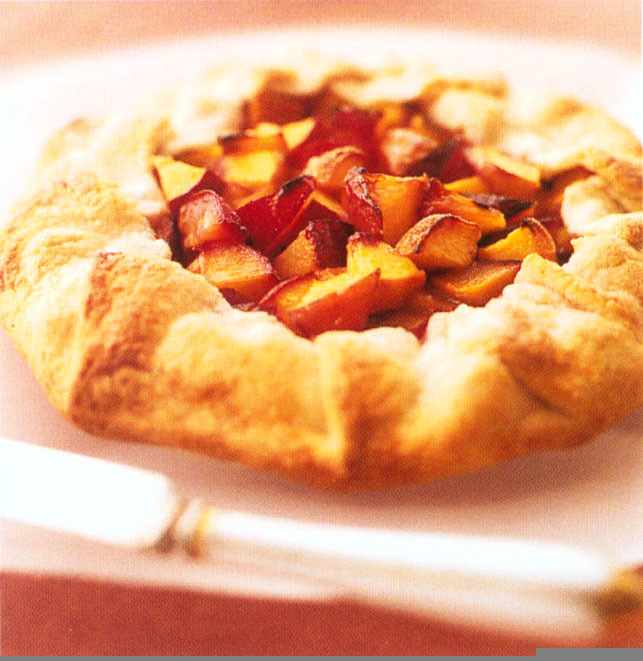 Bake the tart for 40-45 minutes or until the fruit filling is bubbling and the crust is caramelized. Let cool at least 20 minutes on a wire rack. Slide the tart pan bottom to a serving platter. Slice and serve with ice cream. Advance Preparation: Can be made up to 8 hours ahead and kept at room temperature. Serve room temperature or reheat in the a 325F oven for 10 to 15 minutes.